The book started out so good, with so much promise and action, I actually thought this was going to be a great YA book. I’ve read Julie Kagawa’s previous Fantasy series “The Iron Fey” which was a lot more lovey-dovey and consisted of mainly YA clichés strung together, so I wasn’t expecting that much from this book. Or was I? Maybe I thought Kagawa would find her drive with a vampire story and (as I told before) at first I thought she succeeded. The story takes a thrilling start with a human girl in a post-apocalyptic world ruled by vampires and infested by rabids (the mindless kind of vampire/zombie). Allison lives in the outer sectors of New Covington, a vampire city, where she lives a life of starvation and hiding. We get a lot of action and tense moments when Allie goes scavenging for food outside the city walls, where the rabids have free reign. These scenes actually made me think of Cherie Priest’s “Boneshaker” where the main characters have to run from zombie-like creatures in an abandoned city. And then (spoiler!) she becomes a vampire. After that I get the feeling that lots of the tension and action has to make way for emotions. Mind you, I like a bit of emotion in my books, if I read a romance novel I actually like a lot of emotions in my book, but this just felt to YA’y “I-have-to-push-a-love-story-in” and “my-main-character-should-struggle-with-everything”. It felt like these elements were put in the story because the author had the feeling they had to be there to make a good YA story. I don’t think that’s necessary. Allison should struggle with becoming a vampire, but it all sounded too easy and too fabricated. The ending is another explosion of action (riddled with emotional stuff), which made up for the rather lagging middle part, but it couldn’t convince me enough to actually stamp a “GREAT YA BOOK” on this one. Although Kagawa’s writing is clean and very easy to read (really, you’ll breeze through her books, I’ve always read all her books from cover to cover in a ridiculous amount of time), I do have some issues with how she constructs her stories. I’ve had the same feeling in some of the Iron Fey books and it struck me again with “The Immortal Rules”: sometimes I get the feeling Kagawa is working towards an element in the story and she’s bending and twisting it to end up right there. This gives a lot of ‘coincidences’ and cheap shots that make me frown. I wish she’d make the story flow a little more and throw some unexpected things in the way of our heroine, because every single thing that happened I could’ve predicted some pages ahead of it actually happening. 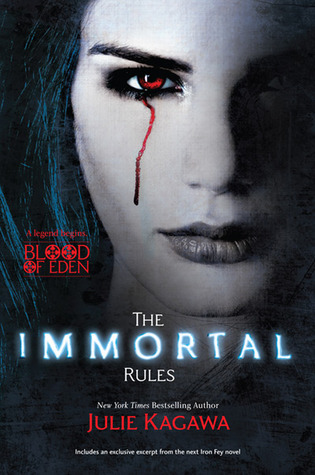 All in all I think this review will come across as a little harsher than I intended it to, because I didn’t really dislike “The Immortal Rules”. I didn’t particularly like it either, I’ve read much better. I’m sort of neutral about it. I think a lot of teens will love this and others might like it, because it has good elements and it keeps you flipping the pages. I think Kagawa and I will just never have that click, her writing lacking that something more that I need in my books. If you liked The Iron Fey, you’ll probably like this, so give it a try, you might have the connection I missed. Also, check out Zoë's post about the cover art. Interesting, huh?